Please note: Starting Fall 2019, this program will be known as the Master of Arts in Clinical and Mental Health Counseling. If you begin your program before Fall 2019, you may switch to the new name if desired once the new program is released. Both tracks are equivalent and are accredited by the Council for Accreditation of Counseling and Related Educational Programs (CACREP). Liberty University’s Master’s in Professional Counseling degree online is designed to equip you with the specialized training you need to gain state licensure and become a Licensed Professional Counselor (LPC)*. An LPC is a licensed mental health professional who is trained to work with individuals, families, and groups in treating mental health and behavioral problems. With CACREP accreditation, this program will meet the highest standards of counselor preparation that will be respected in the mental health community. By earning this online counseling degree, you will enhance your understanding of human psychology through field-tested techniques and learn best practices for promoting the mental health and holistic wellness of clients in diverse communities. Our Masters in Counseling degree online will develop you into an ethical, well-trained mental health counselor with the knowledge, values, and skills to help empower others to make positive changes in their lives. Completing Liberty University’s counseling degree online prepares you for counseling practice through rigorous academic courses, dynamic interaction with mentors and faculty, and a carefully structured practicum and internship process. *Please verify with your state that this program will meet licensure requirements. Why Choose Liberty’s Masters in Professional Counseling Degree? Do you want to empower others to conquer their personal challenges and become healthy and productive? Liberty University’s online counseling LPC degree will prepare you for a rewarding career as a licensed professional counselor with a CACREP-accredited degree. Learn evidence-based, field-tested skills from professors who not only have years of real-world counseling experience but who are also committed to mentoring their students. You’ll have the opportunity to meet with some of them personally during your visits to Liberty’s beautiful Central Virginia campus for two on-campus intensives. You’ll also observe professional counselors in their own practices during your counseling practicum and start honing your own counseling skills throughout a two-semester internship. Once you complete your Master’s in Professional Counseling degree online and pass your state licensure exam, you’ll be equipped to pursue a fulfilling counseling career in healthcare, community agencies, education, social services, or private practice. Liberty University’s counseling degree online provides you with a flexible, effective pathway to licensure that prepares you for a rewarding career. What are the Benefits of Liberty University’s Professional Counseling Degree Online? This program was ranked on the BestCollege.com list of Best Online Masters in counseling programs for 2018. Liberty’s online award-winning learning environment means you can complete your coursework on a schedule that fits your life. Our flexible, on-campus intensives scheduling gives you the opportunity to visit Liberty University’s beautiful campus in the Blue Ridge Mountains of Virginia. Your practicum and internships will give you hands-on, marketable experience working directly with hurting people in your community. While Liberty’s residential M.A. in Clinical Mental Health Counseling and Ph.D. in Counselor Education and Supervision have been accredited by the Council on Accreditation for Counseling and Related Educational Programs (CACREP) for some time, we are proud to announce that Liberty’s online M.A. in Professional Counseling has received CACREP accreditation. This accreditation comes after much hard work, perseverance, diligence, and commitment to excellence by School of Behavioral Sciences faculty and staff. What Will You Learn in Our Online Masters in Professional Counseling Degree? Liberty University’s Master’s in Professional Counseling degree online provides a foundational series of courses designed to provide content for Ethical and Legal Issues in Counseling, Multicultural Counseling, Theories in Counseling, and many other areas of knowledge for evidence-based best practices that are essential for the counseling practice. Our online LPC degree focuses these critical knowledge areas into Group Counseling, Psychopathology, and other important assessment and practical skills areas so that you will be equipped for your observational and hands-on work during your practicum and internship requirements. These courses will give you the necessary skills and knowledge to be an effective mental health caregiver in your chosen field. By earning your online degree in counseling through our master’s program from a nonprofit university whose online programs ranked in the top five of more than 2,100 online colleges and universities for academic quality, affordability, and accessibility, you will be set apart from others in your field. Through two required on-campus intensive courses, you will meet and collaborate with peers and professors while completing your online degree on track to obtain your LPC. Be mentored during your first hands-on counseling experience through the online Counseling degree’s two-semester internship, providing necessary state-reported hours for licensure and valuable field experience. Complete your coursework on a schedule that fits your life with Liberty’s online award-winning learning environment. You may also be interested in exploring our master degree in Addiction Counseling, Marriage and Family Therapy, or Human Services Counseling. One 3-credit hour observation-based practicum. 6-credit hour internship over two semesters (three with approval). Review the Background Check and Comprehensive Exam information. Download and Review our Masters in Professional Counseling Degree Completion Plan. This program is CACREP accredited. The M.A. in Professional Counseling program may lead to licensure as a Licensed Professional Counselor (LPC) in most states. See which states have unique board requirements. You can read more about the National Counselor Examination on our Counselor Education page. View our Master of Science in Professional Counseling degree Course Syllabi (login required). 8-week format, eight different start dates per year and no set login times. The online Counseling degree is specifically designed to assist students in pursuing all required state licensure areas of knowledge and practice. This allows students to pursue state-regulated counseling positions to work in private, public, and nonprofit roles where counseling and human services skillsets are required. 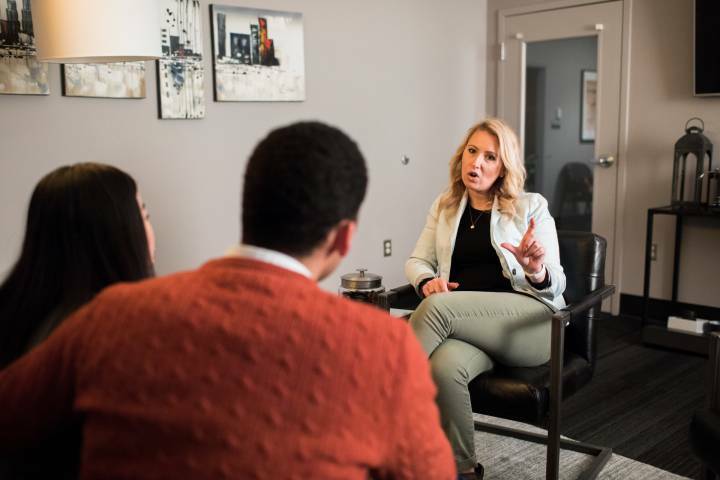 After completing Liberty’s online degree in Counseling and undergoing state licensure requirements, students may be able to start their own private practices in counseling. *Bureau of Labor Statistics, U.S. Department of Labor, Occupational Outlook Handbook, 2016-17 Edition. Information obtained on August 21, 2018. A regionally or nationally accredited Bachelor’s degree with a 2.7 or above cumulative combined GPA is required for admission in good standing. Please visit our Admission Requirements Page for more detailed admissions information.